Cars were moving at speeds well below the school zone limit near Franklin Township Middle School East on Wednesday afternoon. 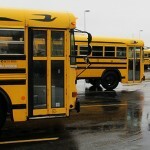 Wednesday was the first day of classes at all Franklin Township schools — and also the first day that a Franklin Township student couldn’t ride district buses without paying a fee of $40 or more after the district made deep cuts to its transportation budget. 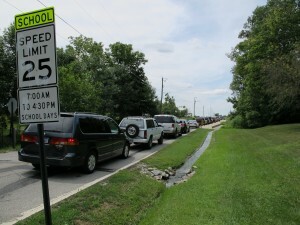 The cuts have offered district parents two unenviable options: pay at least $600 per year to bus their kids to school or brave long drop-off and pick-up lines and traffic snarls to drive their kids to school themselves. But fielding dozens of calls from peeved parents today is just the beginning of Franklin Township superintendent Walter Bourke’s frustration. He’s mad about state policy changes which he says caused the traffic headaches outside schools across the district. Bourke says he’s not sure who deserves blame for revenue losses that led to the cuts to district busing. He expressed particular frustration, however, about property tax caps voters approved last November, which he says have effectively cut off a $16 million revenue stream to the Franklin Township schools. “Now, families have to pay for the services that were once paid by property owners through property taxes, and you’re going to find that more and more and more in the future of Indiana,” Bourke said. Bourke says the district was forced into the cuts after voters rejected a district-wide levy in May. He said in public meetings leading up to the vote, he was explicit in saying a failed levy would mean charging parents for busing. “This is us doing more with less money,” Bourke said.